This was the story of Leicester's season. A promising - tremendous, even - attacking display utterly undone by lacklustre defending. City conceded from a set-piece and late in the game to continue a trend of letting-in goals softly or late-on that has cost the side serious points this season (as excellently demonstrated by the Experimental 3-6-1 blog). City must sort-out their defence. It has been said time and time again but, to concede fourteen goals in four games on the road is a shocking record. Looking at the whole season doesn't improve matters. if taken across the whole season, (Played 37, Goals Against 47) City's form compares strikingly to that which saw the Foxes relegated to League One in the 2007/08 season (P 46, GA 45). For quarter of an hour tonight, Jermaine Beckford was a hero. He had put the Foxes back ahead shortly after City fell level again to a resilient Blackpool side and, with results elsewhere falling favourably for Leicester, Beckford had briefly put the Foxes back in play-off contention. As it finished, City have an uphill struggle for the remainder of this season but Beckford is on form and firing on all cylinders. A terrific performance from him culminating in two well-taken and well-deserved goals. With Beckford taking the plaudits and two goals his strike partner, who himself bagged a goal, should not be forgotten. Between them, Beckford and David Nugent have scored nearly thirty goals in all competitions, surely proving their worth as a duo up front. Both have individual talent but tonight demonstrated that they are capable of working in tandem to destroy a defence, as they undid the Tangerines to devastating effect. It was a shame only that Blackpool's offensive line-up were more than capable of nullifying that threat against Leicester's defence. Once again to blame for the opponents finding the back of the net, Schmeichel is a man out of form and low on confidence. Naturally he is yet to stoop to the low morale that hampered Chris Weale's season last year but he is visible less confident in his shot-stopping and in one-on-one scenarios. For a man hailed after his arrival as the best goalkeeper to wear the Leicester jersey in over a decade, he is disappointing many at present and needs a stellar performance to boost confidence in himself, his defence and the crowd. The facts are vivid. 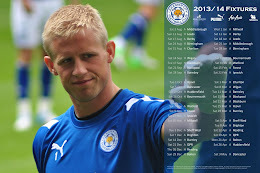 Since his arrival in the heart of Leicester's defence, he has made ten appearances and the Foxes have conceded twenty goals. Wes Morgan is by no means a bad player - far from it - but his arrival mid-season unsettled the camp, particularly after the supposed fracas between manager Nigel Pearson and Matt Mills. Questions are being asked, rightly, on Leicester's defence and as to who should be the right choice at centre half and it seems Mills, like Sean St Ledger earlier in the season, may yet find his way back into the first-team fold - if only to provide a different option more than due to his record to date.